“Enlightened Billionaire” It is translation of Original Hindi word "Aishvaryavan Muktatma". In the eastern countries in past few thousand years tremendously significant experiments have been done by Yogies, Sufies, Rishis, Lamas… All these experiments were within oneself, to awaken the consciousness, to enrich oneself in the inner world, the spiritual world. These experiments are immensely significant and we need to appreciate the richness of the inner world. In the western countries, in past few hundred years lots of scientific experiments have happened leading to modern technological development, industrial revolution and so on. We must appreciate the usefulness of the modern technology (because of which you are able to read this!) but we must also understand that Industrial revolution, nuclear energy and modern technology have its own side effects in the form of destruction, if not used properly. The decisive factor is the human values which are directly connected to the evolution of consciousness. There is very thin line between need and greed. It is the greed of the human mind that has created trouble with the modern technology and not the technology itself. In the east, few people could scale great heights in consciousness…Examples: Patanjali, Astavakra, Krishna, King Janak, Buddha, Mahavira… (The percentage of this is very small) but the eastern masses remain more or less poor materially. Even today in most eastern developing countries the poverty levels are very high in villages and many suffer the lack of basic amenities. In the west, because of technological development, the material affluence could add to comforts of living but most people are hungry and thirsty of inner happiness in the midst of plenty in the material world! In a way east and west both are half and unhappy. The time has come to create a “Total Human Being” on this planet who is materially happy and spiritually happy too! My word for material affluence is “Billionaire”. It does not mean having Billions as bank balance but it represents material comforts for masses… It means availability of basic necessities of life without struggle, for everyone without any discrimination. And I choose “Enlightenment” as my word representing the peak of spiritual evolution. So, I use “Enlightened Billionaire” as a phrase for “Total Human Being” who is happy in material world and also happy in spiritual world. This is the ultimate potential of every human being on the planet earth. “Enlightened Billionaire” phenomena is happening on planet earth since more than five thousand years. King Janak was the first enlightened billionaire in the recorded history. He was king who got enlightened while discussing with sage Astavakra. Lord Krishna was “Enlightened Billionaire”. Absolutely kingly, rich, affluent materially at the same time his consciousness was awakened. He was “Enlightened Master” who was absolutely life positive who said yes to every aspect of life including material comforts, love and romance, peace and war and all types of yoga and everything. That is why we say Krishna, a purnavatar! He said yes to everything, that is enlightened billionaire. He is truly “Purna Purushottam” (Complete Human being and best amongst all). He convinced Arjuna do his duty of fighting for his rights, for establishing dharma. Siddhartha was a prince with all the material comforts but wanted to know the ultimate truth. He left his palace in search of truth… He got awakened and became Buddha! He understood the importance of walking the middle path and he promoted the same. When the consciousness is developed, the affluence is used for establishing Dharma. Riches are used for well-being of humanity. This is a wonderful attitude of “Enlightened Billionaire” which is most wanted on planet earth today. India has seen many industrialists with this approach. JRD Tata was one such industrialist who had human well-being as his core value. In modern India, Narayan Murthy and KC Shroff belong to this category. And there are many such enlightened billionaire, known and unknown… all over the world. In traditional oriental culture, sadhus, swamis, renunciates, lamas, saints… say no to material world and this aspect of renunciation (tyag, Vairagya, udaseenta) has been overly glorified. “Brahma satya, jagat mithya” (Consciousness is truth, world is illusion) is wrongly interpreted. The eastern cultural conditioning promoted by sadhus and swamis is you get enlightened only if you renounce the world. This is the general perception that masses have. Hence all those interested in spiritual evolution, even today, opt for dropping out from householder’s responsibilities and become sanyasi / monks. Because they do not earn their bread, they remain dependent on either their organization or some senior Swami who has resources to feed these monks. Sanyasi beggars’ days are gone. Modern spirituality is affluent -enlightened, and that is the concept we are starting. In the modern days even sanyasis need to work and earn their bread. Once upon a time, there were two beggars. One beggar was blind and the other was lame. Both used to beg in daytime in town and at night time they would go in to the forest to rest. Once it so happened that the forest caught fire and all the villagers were worried that both the beggars will die as one was not able to see and the other was not able to walk. The blind beggar was feeling the heat of the fire, the lame beggar could see the fire but because he could not walk he was not able to run away. Suddenly both the beggars got the idea! The blind was not able to see but he could walk and his legs were strong. The lame person could see but could not walk, so they struck a deal. The blind person should carry the lame person on his shoulders. The lame person could see so he will guide the way, the blind person cannot see but could walk so he can run on the guided path. In this way both escaped from the fire of the jungle and had the blessings of life! Indian stories are not ordinary stories. They have tremendous spiritual insights in them. A materially affluent person who says “yes” to the material world is more like a blind person. He can walk because the resources are available but he can’t see because he doesn’t have the eyes to see. A sanyasi who says “yes” to spirituality develops the eyes, the vision to see, so he is able to see but to walk he needs the support of the resourceful person. That is why all the sanyasis are supported by the king or affluent person. A blind man cannot see and the lame cannot walk, so they have to associate. Always the humanity remained half and never became full, complete and that is the evolution that is required right now on the planet earth. Each person has to become integrated whole, total human being. A materially affluent person is blind; a spiritually rich person is lame. Both are half but when both of them come together, within you that is “Enlightened Billionaire”, only then you become complete. Monks and nuns are avoiding the material world; material world people are avoiding spirituality. Both are half and they both have to become total. Say “yes” to material world and say “yes” to spiritual world and be an Enlightened Billionaire and that is the ultimate that is possible. You will actualize your potential to the fullest! The time has come now for eastern countries to come out of this cultural conditioning and change the mind set. We have to re-arrange our life and change the mindset which says yes to affluence, which says yes to enlightenment - both. That is the real, total, complete human being. And, it is possible… for enlightenment one need not say no to material affluence. On the contrary the time has now come where material affluence and enlightenment has to go hand-in-hand to have that completeness in human aspect. Now the time has come when more & more people will have to lead by example – that affluence & enlightenment go hand-in-hand, and that’s the only way to live life in the modern era. Enlightened Billionaire is a one who will say yes to enlightenment and yes to affluence, richness, and resourcefulness. So we need to work on this aspect, change our attitudes, and change our mindsets. Don’t get carried away by the Enlightened Beggars (begging for material wealth) or Billionaire Beggars (begging for spiritual wealth) – both are beggars – understand this. We don’t want to be beggars; we want to be like King Janak, Enlightened Billionaire! Tremendous affluence outside, tremendous richness inside. That is the way to live life. We need to change our mindset. We have to come out of old mental patterns / engrams / conditioning / samskaras / psychic impressions… whichever word you understand! We have to create the new mindset where spirituality & affluence go hand–in–hand. To create enlightened billionaires on planet earth is a very big challenge. They have to work and be materially comfortable on their own and also simultaneously do spiritual practices for enlightenment. The right use of scientific technology we have, can make us materially affluent and the right use of spiritual technology that we have will make us rich spiritually form inside, at the level of consciousness. That is the way, more and more people can become enlightened billionaires! “Enlightened Billionaire” is a “REVOLUTION” of tremendous significance. Because we will be creating the new path on which millions more people will be walking in the future. We have to be the living example of this. We have to become what we are foreseeing. We have to be the change we want to see in the world! And we have to lead by example – We have to first create this possibility for us and we have to live life that will inspire thousand others! Our LIFE has to create the confidence and feeling in others, that yes, it is possible! If you see what is happening today, in general, most people are saying yes to material affluence, but they are not saying yes to enlightenment! They are not growing in consciousness. So, it is still poverty consciousness - they are not into the enlightened consciousness. Only the enlightened consciousness can be the prosperous consciousness. A major shift has to happen from “poverty consciousness” to “prosperity consciousness”. That is the main point! We have to work on our understanding through the spiritual technology and parallelly we have to work on our material affluence with right use of modern technology. This combination has the potential to create disease-free, healthy, wealthy human being. Selecting any one at the cost of other will mean that you are diseased & you cannot be happy. You will see all over people are not happy because either the consciousness is not developed or basic material needs are not met. So, we take a stand in favor of “Enlightened Billionaire”. We stand out. We take courageous step of saying “yes” to material well-being and “yes” to enlightened consciousness. This is the fundamental on which we will be working in “Enlightened Billionaire” workshop. 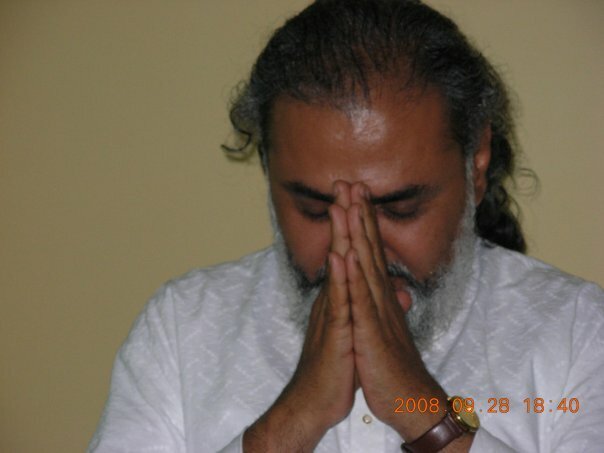 “Enlightened Billionaire” is a 13 point program created by Prem Nirmal and promoted worldwide. We all are one in spirit. Divinity is represented in many forms and that makes this world beautiful. I love you all. Om Prem.